Navy blue is a colour I’ve come to love in recent times. I initially started to wear more navy blue when I started working full time because it was a fabulous substitute for black. As I’ve become very comfortable in my workplace environment my work outfits have become excessively colourful but my love for navy blue has remained. It’s a very classy and sophisticated colour. I also adore the way it looks against brown hair. It’s versatile and looks great combined with pretty much any colour. One of the aspects I love about this look is that it incorporates pattern mixing in a subtle way. This style of outfit paves the way to potentially bolder pattern mixing combinations in the future. Although abstract, the cardigan displays a floral pattern. By carrying on the navy blue theme through the outfit, a connection is established. 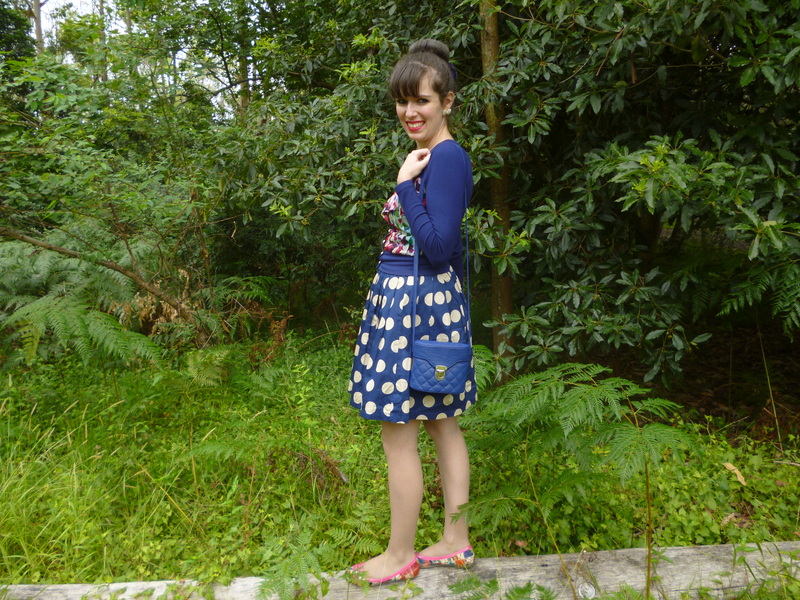 The shoes are also floral (upon styling this outfit I realised that I should wear these flats much more often) so I like that the polka dots sit between two floral pieces. 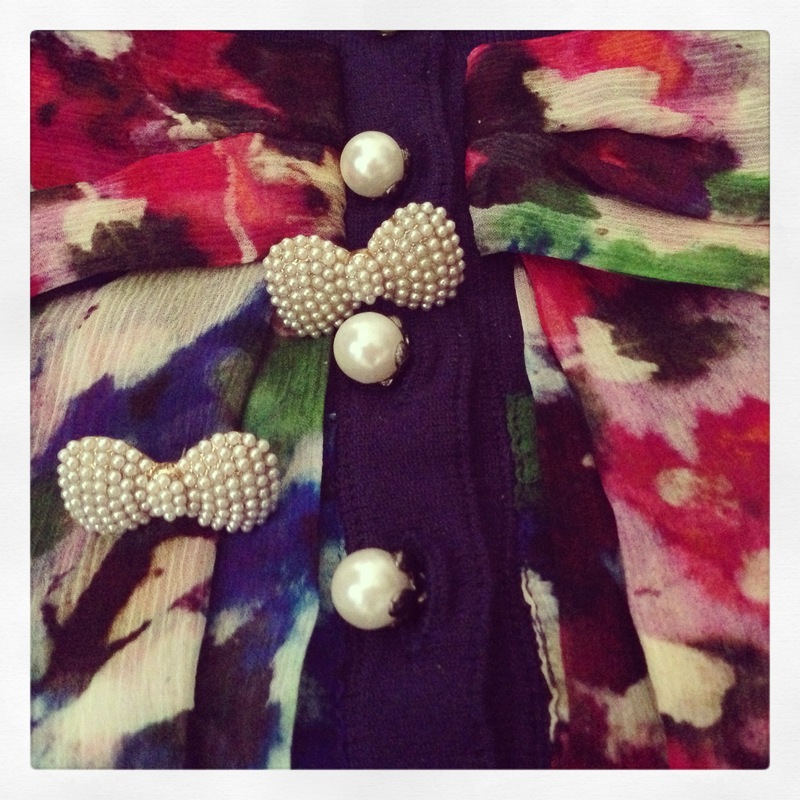 The colour mix coupled with the pearl buttons creates a lovely finish to the cardigan. It’s great to wear this skirt for the first time. I’ve had it lying around the house for so many months now. It was missing a button and I finally got around to addressing this. I can’t believe it took me so long to performe the extremely simple task of sewing a button on a skirt. I’m looking forward to creating many looks featuring this skirt which primarily feature red or pink. It’s been such a busy week! The good news is that I survived my on campus week at law college (the course now becomes online) and I’ve completed all the requirements for the first week. Small steps are the way to go. I’m much happier now it’s over and I’m back at work. Thanks so much for all your support. 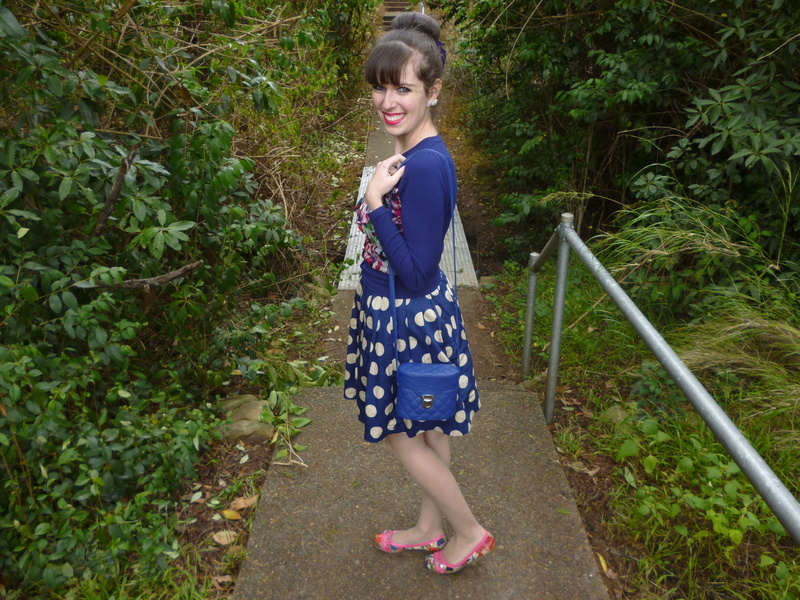 This entry was posted in Alannah Hill, Dangerfield, Outfits, Uncategorized, Wittner. Bookmark the permalink. 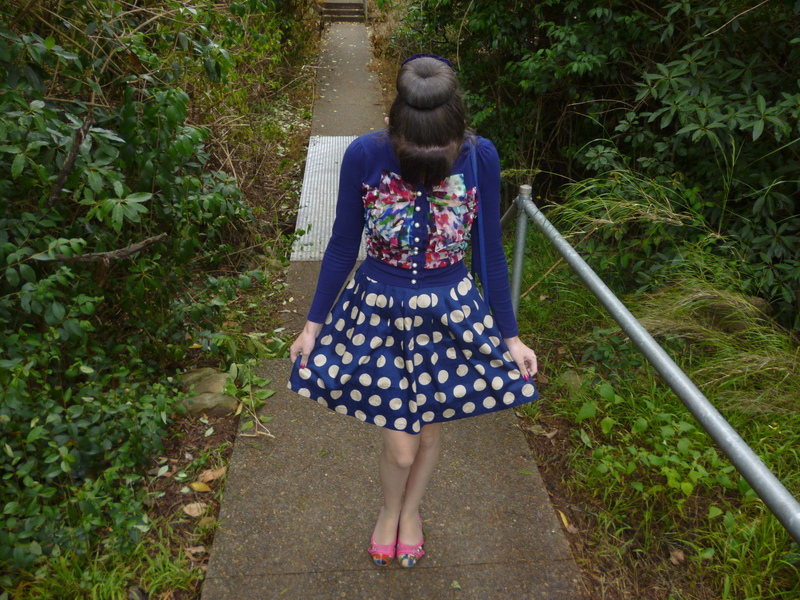 You are so lovely, the polka dot skirt is amazing! Navy looks good on you. Love the mix of patterns, polka dots and florals is currently one of my favorites. Adorable! Love the floral with the polka dot and the pink shoes that pick up the pink in the blouse! You are completely right that navy blue is such a great color! I love how well it goes with everything! Loving this outfit. Great skirt and cardigan! I love the colour! And the handbag is so cute. You have a very nice style. I love navy blue too. You look lovely; Nice styling. i agree — navy blue is a great color, especially for a business environment. wearing black all of the time can get boring. 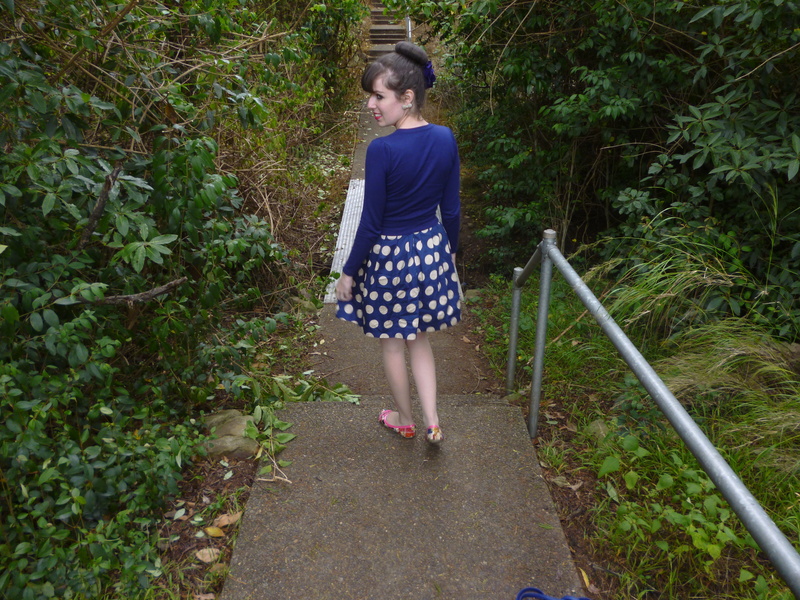 really love your polka dot skirt! i always have clothes laying around forever that i need to fix. 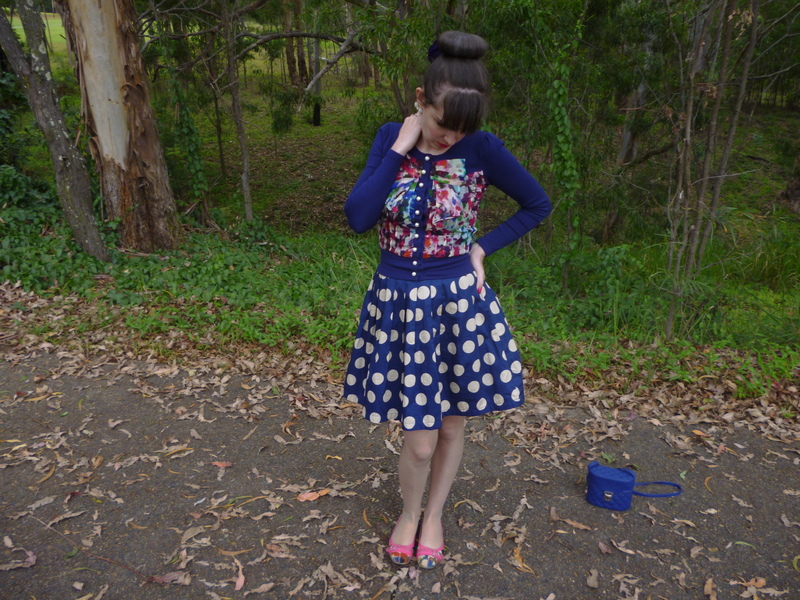 The cardigan is awesome – you look great with it on! Love the pairing of polka dots with floral print! Really nice look, the skirt is so lovely! 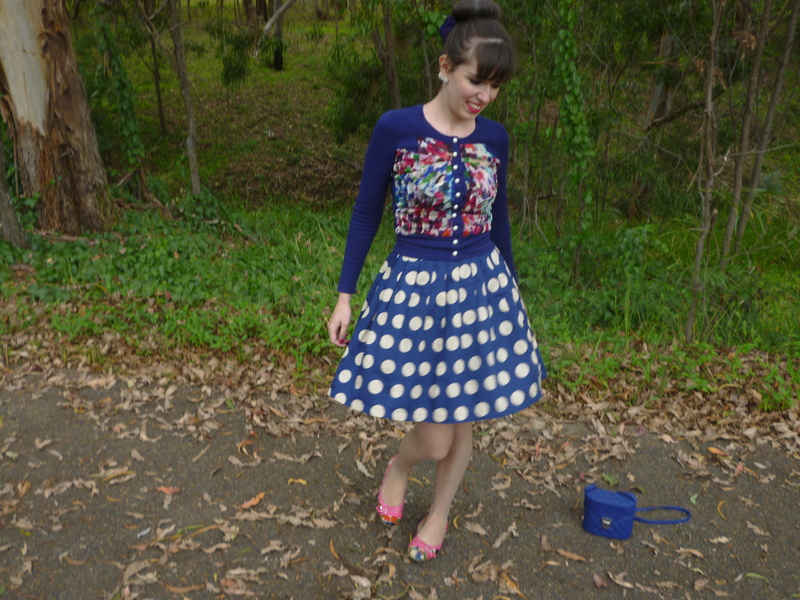 This outfit is so whimsical! And I definitely agree with you about the navy! It always seemed to be the perfect boundary color between corporate life and regular life. Also, your bun looks perfect! I love the bold colors on the cardigan and shoes and how they're “muted” by the navy background! Happy for you that the return to school went well!